What Type of Portable Restrooms Should I Rent? Most of us have seen a porta potty at a special event, along the route of a foot race, or sitting on the property of a construction project. However, if you’ve only ever used porta potties and haven’t ever selected one for your own event, you may benefit from understanding what porta potties are available for your event and which portable toilets will fit your circumstances best. 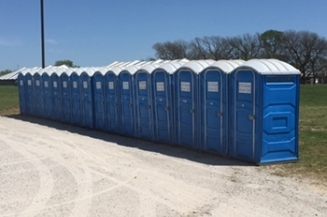 Here are a few things to remember about selecting a porta potty for your next event. A traditional porta potty is appropriate for a variety of situations like construction sites, local 5K races, and small events like neighborhood barbecues or gatherings in the local park. If you’re hosting a single-day event and expect around fifty people to attend, you can usually choose a single, traditional porta potty for the occasion. Traditional porta potties for rent are also an ideal solution for construction sites where workers may relocate to different areas of the property as they complete work. Your local porta potty company can relocate their toilets every few weeks or as needed to accommodate your workers. If you decide traditional porta potties will suit your plans best, you may wish to consider handicap porta potty rentals, too, particularly if you’re not sure whether you’ll need to provide a toilet for someone with a physical disability. For virtually all events where your guest list isn’t set, providing a handicap toilet is a safe and appropriate choice. Local and state laws may also require that you provide handicap accessible toilets for your guests, so it’s a good idea to check whether local regulations may require certain types of facilities at your event. Your portable toilet rental company can also advise on whether you may need to include a disability-friendly porta potty. Some events may require additional facilities beyond a basic porta potty. You may decide that adding hand washing stations to your traditional porta potty order is enough, but you may also decide that upgrading to fully-featured mobile restrooms might be a better option. For example, if your event will feature nicely dressed guests, a restroom trailer with some extra room and privacy may offer the best experience for your guests. Although basic porta potties from a reputable portable sanitation company will always provide a simple and clean experience, upgrading your toilets to restroom trailers for rent is a decision to consider. Do you want to impress your guests and make them forget that aren’t any traditional toilets in the vicinity of the event? A mobile restroom trailer might help. One factor that can significantly impact the success of your porta potty selection is the company with which you work. It’s often best to work with companies like Got To Go Solutions that offer experience in the portable sanitation industry, and this may mean exploring the reputation and availability of porta potty companies rather than focusing solely on the price of the potties and rental services. Get in touch with us today for more information!